Who says you can't be green and spooky too? Here are three ways to enjoy a spooktacular Halloween that's fun, good for you and the planet too. 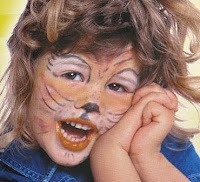 There are loads of products out there for making up your little lion, pirate, princess, witch or black cat, but aren't you just a little concerned about the potentially toxic ingredients you're smothering on your child? And what about the washability factor? Then there's the quality, ie. do they actually work. 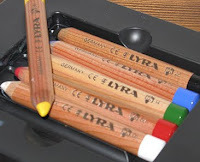 Lyra is an established European art supply company that's been around since 1806. Their pack of six face painting pencils is dermatologically tested and non-toxic. The leads are extensively compressed (for high intense colour) and encased in a wooden barrel for easy handling. You don't need to dip them in water to start painting and they wash off easily with warm water. Check out Monday's review on ParentingPink.com for more. These top quality pencils are made in Germany and come in two different colour packs of six - the basic has the primary colours plus green, black and white and the plus pack includes gold, silver, pink, purple, orange and brown. For more coverage, try these plant-based body and face paints. They're all natural and completely toxin-free - ideal for any little witch, devil or ghost with sensitive skin. They're also made in Germany. And for dressing up nails and eyes without the nasty chemicals, try made in Canada water-based nail polish or mineral eye shadow in bright blue or glittery pink. With eco being the trend, why should Halloween be the exception? Admittedly, spooky and gruesome does translate well into highly toxic plastics found at the dollar store but why not go green on October 31st with biodegradable classic pumpkins - carved and glowing or even painted - hay bales, ornamental corn, cobwebs fashioned out of hemp string. 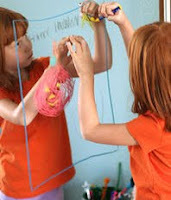 Give the little ones a pack of non-toxic window crayons to go crazy with on the front window - rather than splurging on throwaway paper or cardboard decorations that tend not to last. If buying Canadian to help lower your carbon footprint and support the local economy and jobs is important to you, stay the course for Hallow's Eve. There's no need to stray. These kids' helmet covers are made in Ontario and ideal to top off any Halloween costume. Choose from a red devil, lion, shark, zebra, pig, bunny or turtle. They'll keep your little one's head warm during the big trick or treat and beyond. These covers stretch to fit any helmet - bike, ski, snowboard, skate, equestrian - and not only increase visibility of the wearer on the slopes, roads, rink, etc. but encourage kids to wear their helmets and provide added warmth. For the ideal black cat costume that doubles for dance class, there's a lovely all-black tutu - often a challenge to find - made in Vancouver. If you're pressed for ideas, there's always rentals - a great way to reuse. Don't forget local thrift stores and charity shops are are virtual costume treasure troves - and supporting them means you also support a good cause for a Happy Halloween all around. Enter our contest to win a Glam Pack for a green Halloween simply by telling us about your best ever Halloween costume. If you have any thoughts or ideas about how to green Halloween, we'd love to hear them. Please leave a comment below.